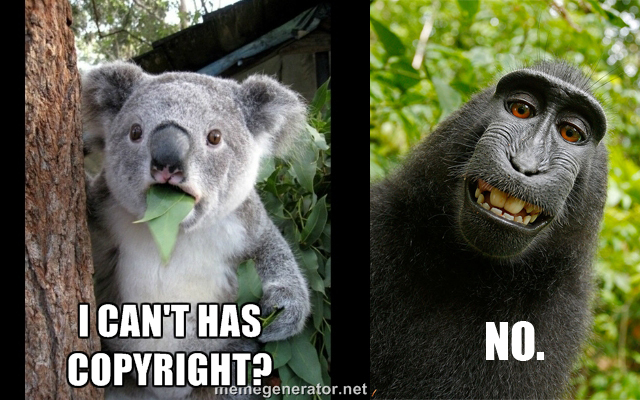 Earlier this month I wrote here that it would be very difficult to argue that a monkey could create a copyrightable work. Seems I was right. So not only is the US Copyright office saying that an animal cannot author a copyrightable work, they are also saying that that particular work, no matter how cute or creative it may seem, cannot be registered with the US Copyright Office. And under US law, without that copyright registration a copyright lawsuit is untenable. One last thing to note: although the Compendium is an administrative manual meant to provide instruction and guidance to its staff, attorneys, scholars, and the courts, it does not have the force and effect of law. However, it does have persuasive power, and the Supreme Court has said that as such, it is perfectly acceptable in a court of law.